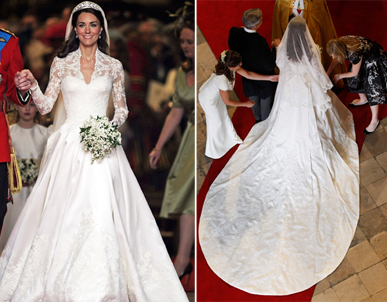 The designer was finally reveled and i think the moment all us fashionistas were waiting for finally came.The beautiful Alexander McQueen dress was designed by Sarah Burton.The dress was ivory with an amazing hand embroided English design. We all expected a much more extravagant dress but this one was made to fit her style! Bravo I loved it! Previous Grupo 24 Horas #1 En La Categoria Tropical De Los Billboards! Next William And Kates Wedding Album! Enjoy!/ El Album de Boda Del Principe Y Kate!